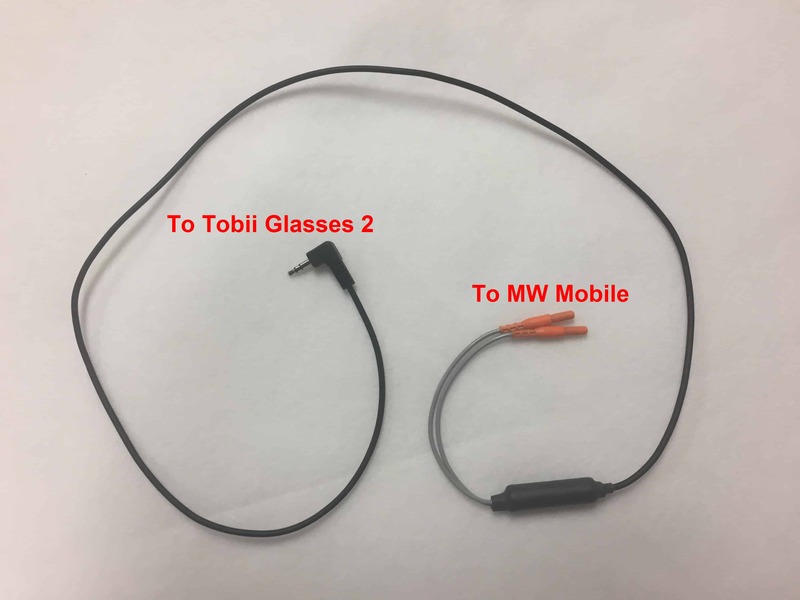 The MindWare Mobile to Tobii Pro Glasses 2 Interface cable allows you to synchronize physiology data collected on the MW Mobile with eye tracking and video collected using the Pro Glasses 2. Using the interface cable, a synchronization pulse from the Pro Glasses 2 can be captured on the Bio 2 channel on the MW Mobile. The synchronization pulses can be used to trigger and log events in local mode, or transmit events in Wifi mode. This article will show how to properly connect the cable between the Pro Glasses 2 and the MindWare Mobile. 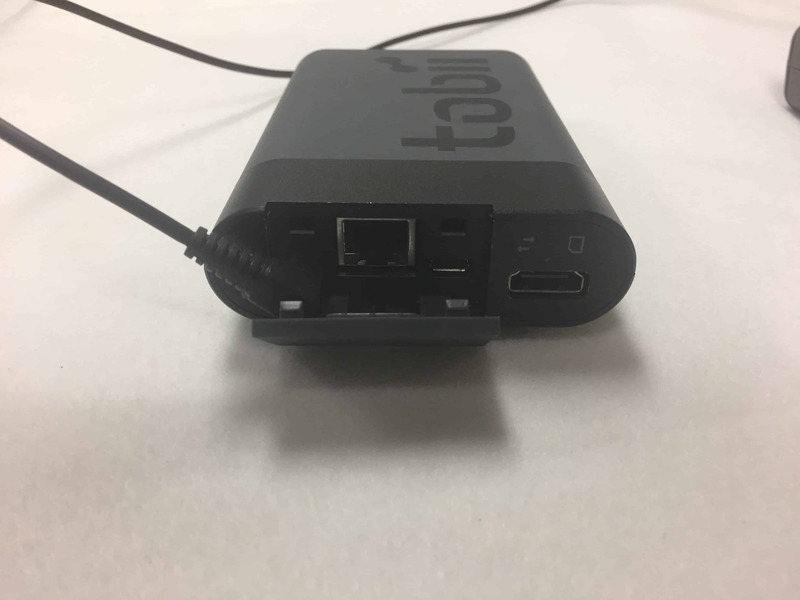 The MW Mobile connector consists of 2 orange touch-proof connectors. These are intended to be plugged into the Bio 2 channel on the MW Mobile, and are color coded as such. The Pro Glasses 2 connector is a male right-angle 1/8″ stereo plug. This gets plugged into the Recording Unit portion of the Tobii system. In the middle of this cable is an isolation barrier to protect the subject from potentially harmful electrical currents. 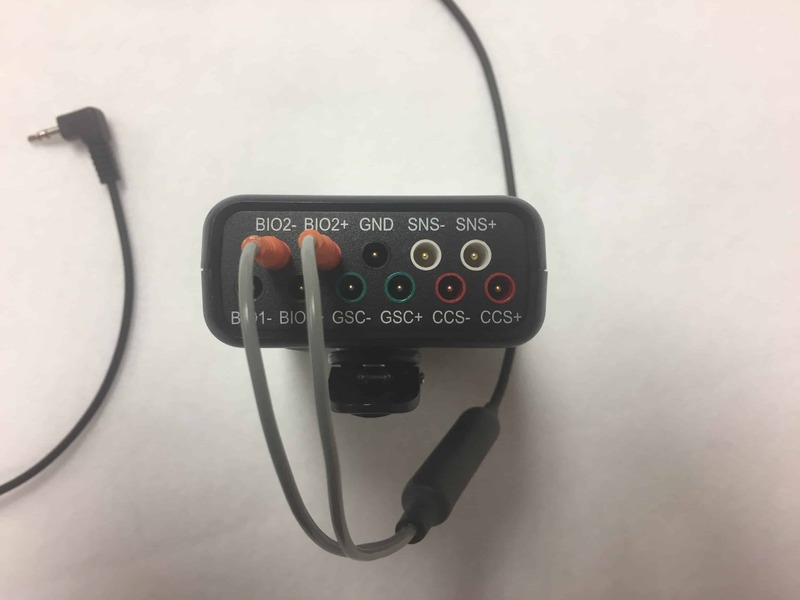 Simply take the 2 orange touch-proof connectors and insert them in the Bio2+ and Bio2- inputs on the MW Mobile. It does not matter which connector is plugged into which input. Open the plastic cover on the Recording Unit exposing several connectors. Plug the remaining end of the cable into the 1/8″ (3.5mm) connector to complete the connection. Refer to the Tobii Pro Glasses 2 User Manual for further assistance. Power on both the Mobile and Pro Glasses 2 and start triggering and log events in local mode or transmitting events in Wifi mode.